Federal Reserve Chair Janet Yellen faces an economy that is starting to look more like the 1970s than the 1990s. Federal Reserve Chair Janet Yellen faces an economy that is starting to look more like Arthur Burns’ in the 1970s than Alan Greenspan’s in the 1990s. Productivity growth is slowing, just as it was when Burns headed the central bank, not accelerating as it did under Greenspan’s watch. Business output per hour excluding agriculture has risen at a 1.4% average annual rate since the recession ended in June 2009 as hiring has picked up while economic growth has lagged behind. That result is in line with the 1.5% rate from 1973 to 1977 and less half of the 3% pace from 1996 to 2000, Labor Department data show. The post World War II average is 2.3%. To understand why this is important, look at what happened to the U.S. in each of those periods. In the late 1990s, increased worker efficiency allowed Greenspan to countenance a fall in the unemployment rate to a 30-year low of 3.8% in April 2000 as companies could pay employees more without having to raise prices. In the 1970s, a sudden downshift in productivity growth caught Burns by surprise and led to a rise in consumer prices of more than 10% after oil costs surged. What it does mean is that Yellen and her Federal Open Market Committee colleagues must be a “little more cautious” about keeping short-term interest rates near zero in their pursuit of lower joblessness, said Blinder, who is now a professor of economics at Princeton University in New Jersey. Draghi’s $1.4 Trillion Shot: Silver Bullet or Misfire? Last month’s drop in the unemployment rate to an almost six-year low of 6.1% highlights the dilemma facing the Fed, said Stephen Stanley, chief economist at Pierpoint Securities LLC in Stamford, Connecticut. Joblessness is falling faster than the central bank expected while gross domestic product is expanding more slowly than its projections. Behind the discrepancy: slower productivity growth, according to Stanley. 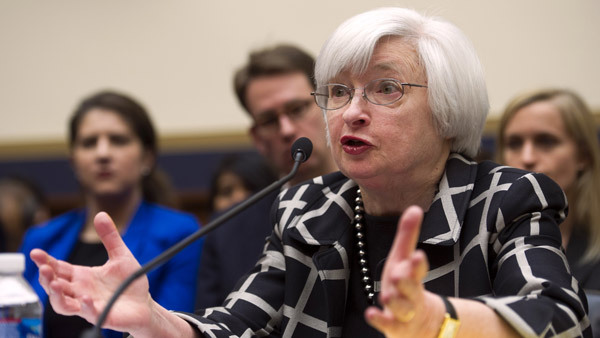 He now sees the Fed starting to raise interest rates in June 2015, instead of waiting until September of next year. Inflation already is showing signs of accelerating. The personal-consumption-expenditures price index, the Fed’s favorite measure, rose 1.8% in May from a year earlier, compared with 1.6% in April and 1.1% in March, according to the Labor Department. Chipotle Mexican Grill Inc. (CMG) is among companies boosting prices. “We really haven’t had any resistance” from customers, Steve Ells, co-chief executive officer of the Denver-based burrito chain, told Bloomberg Television’s “Surveillance” on June 27. The increase of as much as 6% will partly offset higher costs for ingredients and is Chipotle’s first in three years. Long-term interest rates are “going to go a lot higher,” with the yield on the 10-year Treasury note eventually hitting 4%, as price pressures intensify and the Fed lags behind in its response, according to Joe LaVorgna, chief U.S. economist at Deutsche Bank Securities Inc. in New York. The note’s yield was 2.64% at 2 p.m. in New York on July 3, ahead of the July 4th U.S. holiday, based on Bloomberg Bond Trader data. The Fed’s macroeconomic computer model recognizes that unexpected changes in productivity growth can affect inflation, said Michael Feroli, a former central-bank researcher who is now chief U.S. economist for JPMorgan Chase & Co. in New York. The question is whether policy makers will factor this into their decisions on interest rates. Feroli changed his forecast of Fed policy after last week’s news of a further fall in joblessness. He now expects the central bank to begin raising interest rates in the third quarter of next year, instead of the fourth. “It’s true that the decline in unemployment is occurring alongside anemic GDP growth, but the Fed’s mandate is not to ensure strong productivity growth, it’s to get the economy back to full employment and price stability,” Feroli said in a July 3 note to clients. Fed officials have been nudging down their estimates of how fast the economy can expand without fanning price pressures as productivity growth has ebbed. Most FOMC participants peg the economy’s cruising speed at 2.1% to 2.3%, according to their June 18 projections. While that’s down from the 2.5% to 2.8% range they saw in April 2011, it still may be too optimistic, Feroli said. He reckons the rate is 1.75%, with a chance it could be even lower. The recent slowdown also could reflect measurement errors, Blinder said. Productivity is calculated based on the gross domestic product of the economy. If it were computed using gross domestic income, growth would be faster. GDP has risen by an average annual rate of 2.1% since the recession ended, while income has climbed at a 2.4% clip, according to data from the Commerce Department. Yellen played down the significance of the acceleration in inflation this year, telling reporters on June 18 the advance generally is consistent with the Fed’s forecasts. Worker efficiency is especially important because of the emphasis Yellen has placed on the need for higher wages. If employees are able to produce more, companies can pay them more without needing to raise prices to keep profits up. She told reporters she anticipates wage growth will pick up as the labor market tightens and argued this wouldn’t be inflationary as long as the increase isn’t overly rapid. Compensation recently has been growing about 2% a year, by Yellen’s reckoning. Compensation increases of as much as 4% would be “normal” and consistent with the Fed’s 2% inflation goal, she said during a March 19 press conference. That, though, assumes productivity growth doesn’t slacken. Charles Plosser, president of the Federal Reserve Bank of Philadelphia, told the Fox Business Network on June 24 that he isn’t worried about short-term inflation. He did evince some unease with Yellen’s emphasis on wage growth, telling reporters separately it’s a lagging indicator of inflation. Yellen agreed with Plosser back in 2008 that “wages aren’t a leading indicator,” according to the transcript of the April 29-30 FOMC meeting that year. Now though, she stresses there’s still a “significant” amount of slack in the labor market that will help hold price pressures in check even though the unemployment rate has fallen. The risk is she might be underestimating how tight the job market is, just as she could be overestimating productivity. If signs continue to indicate that potential GDP growth has fallen “a lot more than the FOMC has recognized” and there isn’t a large remaining margin of slack in the economy, “the Fed may face some difficult choices going forward,” Ted Wieseman, an economist at Morgan Stanley in New York, wrote in a June 27 note to clients. Check out How to Help Today’s Bond Investors on ThinkAdvisor.